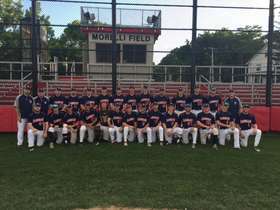 The Melrose Americans compete in greater Boston's Intercity League and play their home games on Morelli Field in Melrose, Massachusetts. The Americans enter each season intent on giving Melrose residents and fans from neighboring cities and towns, a team they will be proud to embrace, and a team that fulfills great expectations, making Morelli Field on game nights the favorite destination for a loyal following of baseball enthusiasts and their families. We wish to extend our utmost thanks to team founder, Eddie DiGiacomo, for his generous, invaluable and continued support of the Melrose Americans Baseball Club, and to the residents and governing body of the City of Melrose for their continued support. Scroll down for the latest updates on the Melrose Americans 2017 season. Please enjoy your visit to our site. After scoring five runs in the bottom of the sixth to take a 8-4 lead over the Watertown Reds Wednesday night at Morelli Field, the Americans were three outs away from a hard-fought, come from behind victory. But in the seventh the roof caved in, the walls fell down and the floor collapsed as the Reds demolished the offerings of catchers turned pitchers Kyle Devin and Anthony Licciardello, scoring eleven runs in the inning and returning to Watertown with a 15-8 win. Watertown got on the board in the first when Will Brennan launched a two-run homer off Ronnie Luke who was making his first start for the Americans. Luke, replacing scheduled starter Mike Peters who had fallen ill earlier in the day, pitched five full innings, allowing four runs, all earned, on six hits while walking two and striking out one. He tossed a scoreless second inning and watched his teammates cut the lead to one in the home half when Chris Hopkins hit a lead off double and scored on a two out base hit off the bat of Dan Cacciola. In the third, Luke again held the Reds scoreless and the Americans took the lead in the bottom of the inning. With one out, Nick Herzog singled, Malcolm Nachmanoff walked and Devin singled to center, scoring Herzog to tie the game 2-2. An out later, Hopkins delivered Nachmanoff with a single to right, giving the Americans a 3-2 lead. The Reds bounced right back in the fourth, taking a 4-3 lead on the strength of a two-run Cal Christofori home run. Neither team would score again until the sixth when the Americans scored the aforementioned five runs. Hopkins was hit by a pitch leading off and Matt Hosman walked. After Charlie Huegi's sacrifice bunt moved the runners to second and third, Cacciola walked to load the bases. Will Shackelford was hit by a pitch to drive in Hopkins with the tying run before Herzog doubled to left, driving in Hosman and Cacciola and sending Shackelford to third. Nachmanoff then singled to send home Shackelford and Herzog, upping the score to 8-4 entering the seventh. Chris Mitchell had pitched a scoreless sixth inning for the Americans in relief of Luke, but he had pitched five and two thirds innings two days earlier and had reached his limit. Out of pitchers, the Americans turned to two catchers in an attempt to finish off the game. The Reds, however, were having none of it and took complete advantage, getting their eleven runs in the inning on a hit batter, three walks and seven hits, including their third home run of the night, a three run rocket to left by Dan Chaisson. With the loss, the Americans fell to 8-9, good for sixth place in the standings. They'll send Zach Begin to the mound Thursday when they visit Trum Field in Somerville to take on the Somerville Royals at 8:15. Chris Mitchell tossed five and two third innings of four hit ball to earn his fourth win of the season and lead the Americans to a 7-1 win over the Reading Bulldogs Monday night at Morelli Field. Mitchell (4-2), who struck out five Bulldogs on the night, was in complete command through five, tossing a tidy two-hitter and issuing two walks. But up 4-0 entering the sixth, he walked Kevin Marciano leading off. He appeared to get back on track with successive strikeouts of number three hitter Ryan Wolfsberg and four hitter Zak Talis. Those outs, however, were the last Mitchell would get. Chris Bosco chased Marciano to third with a single to center before veteran Steve Busby, who played a decade in the Boston Park League before switching leagues and playing another decade in the north of Boston suburbs, roped his own single to center to drive in Marciano and send Bosco to third. When Mitchell walked Nick Berno to load the bases his night was over and Aran Hamilton-Grenham was called in from the pen to extinguish the flames. The Stonehill College southpaw did so with one pitch, getting Rosario Missiti to ground out to Charlie Huegi at second. Hamilton-Grenham earned his first save of the season when he closed out the game with a perfect seventh. The Americans, who seem to be finding their way with the sticks, broke a scoreless tie with three runs in the bottom of the fourth. Nick Herzog got things started when he worked a lead off walk and took third on a Kyle Devin line drive single to left. Chris Hopkins then drove home both with a double to deep left center. Hopkins held at second when Hunter Boyce grounded to third for the first out but he came around to score the third run when Matt Hosman shot a double down the left field line. With the ice broken, the Americans plated another run in the fifth and three more in the sixth to put the game away. In the fifth Dan Cacciola singled leading off and was sacrificed to second by Will Shackelford. Herzog popped to second for the second out but Devin's base hit to left center got Cacciola home and made it 4-0. A Hopkins single put runners at first and second but Reading starter Colby Morris (2-2) got Boyce on strikes to end the inning. After Reading closed the score to 4-1 with their sixth inning run, Melrose tacked on three of their own in the bottom of the frame. Hosman singled leading off and was replaced on the base paths by the newly signed Harry Welch. Huegi, at the plate to bunt, walked on four pitches to put runners at first and second. Mike Goddu, also at the plate to bunt, failed to do so before going down on strikes for the first out. John Jennings, feeling under the weather and on the bench, pinch hit for Cacciola and made the Americans well, sending a double down the left field line to score Welch and Huegi and make it 6-0. Jennings took third on the throw home and scored the seventh run when Shackelford followed with a deep sacrifice fly to right. Devin, Hopkins and Hosman all had two hits for the Americans while Boyce, Cacciola and Jennings had one. Hopkins and Jennings each drove in a pair of runs. The Americans got back to the .500 mark (8-8) with the victory. They will attempt to improve on that mark when they play host to the Watertown Reds at Morelli Field Wednesday night at 7:30. It will be "Melrose Night" at the ballpark and Melrose's own Mike Peters will take the ball for the Americans. The sixth place Americans trail the first place Reds by 7 points in the Intercity League standings but the Americans hold three games in hand over the Reds. A win earns a team two points and a tie earns each team one point. The season series between the two clubs is tied 1-1. Shawn Smeglin was lights out on the mound and the Americans scored two runs in the top of the first inning and never looked back, defeating the Merchants by a score of 5-1 Sunday afternoon at Walsh Field. Melrose took the two run, first inning lead on just one hit, a leadoff single by Will Shackelford. After that single, Wakefield pitcher Steve Xirinachs (2-2) did himself in by walking Nick Herzog, hitting Malcolm Nachmanoff with a pitch to load the bases and walking clean up hitter Kyle Devin to force in Shackelford. Xirinachs then induced a grounder to second off the bat of Hunter Boyce that scored Herzog as the Merchants spun the double play. With Nachmanoff on third and two outs, Charlie Huegi walked, but Matt Hosman ended the inning when he grounded sharply back to the pitcher. That was all the runs the Americans would need as Smeglin (2-1), who pitched the full 7 innings, surrendering only 4 hits while walking four and striking out three, took over from there. After tossing a perfect bottom of the first, he got the first two batters in the second but soon found himself in a bases loaded situation after Nick Napoli doubled and Anthony Cecere and Ryan Collins both worked walks. But Smeglin composed himself and struck out Vin Nardone to escape the threat. Back to back one out, third inning walks to Devin and Boyce and a two out RBI base hit by Hosman increased the Melrose lead before Smeglin pitched around two Wakefield singles in the bottom of the inning to keep the score 3-0. In the top of the sixth, the Americans tacked on two insurance runs. Hosman led off with an infield single and took second when the shortstop overthrew first. He took third on an Andre Gaudet line drive single to right. Mike Goddu then came up large when he singled to score Hosman and send Gaudet to second where Dan Cacciola went in to run for him. Shackelford failed to get the sacrifice bunt down before flying out to center for the first out and Herzog grounded into a fielder's choice to short that erased Goddu at second and moved Cacciola to third. Malcolm Nachmanoff then delivered a clutch, two out single to center to score Cacciola with the fifth and final Americans' run. Smeglin entered the bottom of the seventh working on a three hit shutout. He got pinch hitter Louis Tarantino to ground to short where Shackelford made a great diving stop before throwing to first for the out, but Bobby Losano gave the Merchants life when he singled to center and stole second. He moved to third when Scott Searles grounded to short for the second out. It appeared that Smeglin had completed the shutout on a ground ball to second, but a not so great throw from second baseman Charlie Huegi and poor glove work by first baseman Dave Center resulted in an error on Center, allowing Losano to score the shut out breaking run. Smeglin regrouped and got Dillon Koster to ground out to Shackelford at short to end it. The Americans' bats showed signs of life in this one as they banged out eight hits, two more than they'd gotten in the two previous games combined. They were aided greatly by seven Wakefied walks and two hit by pitches. Nachmanoff and Hosman each picked up a pair of hits for the Americans, while Shackelford, Boyce, Gaudet and Goddu chipped in with one. The Reading Bulldogs will visit the Americans at Morelli Field Monday night. The Bulldogs hold a 2-1 lead thus far in the season series. Chris Mitchell (3-2) is scheduled to throw the first pitch at 7:30. Melrose Matters: LHP Kyle Autilio has been diagnosed with left shoulder tendonitis and has been shut down indefinitely. Autilio is the second Americans' pitcher to be placed on the DL with injury in the last two weeks, joining Mark Fusco who went on the list following an outing against the Somerville Royals July 5. The Americans' bats remained in hibernation against the Watertown Reds Friday night at Victory Field and they were shutout 3-0 for the second consecutive game. The Reds, who also struggled on the offensive end Friday, put together three of their four hits off Americans' starter Zach Begin in the fifth inning when they scored all three of their runs. The Americans squandered a bases loaded, no outs situation in the top of the fifth. Consecutive singles by Chris Hopkins, Will Shackelford and Charlie Huegi off Reds' hurler Nate Beck started the inning, but Andre Gaudet forced Hopkins at home on a grounder to shortstop for the first out, Mike LaRovere struck out looking for the second and Dan Cacciola grounded out to short for the third. Watertown took full advantage of the squander in the bottom of the fifth. Begin entered the inning with a no-hitter but Mike Samko put an end to that when he led off with a triple to center field. Justin Forman followed with a single off the glove of a pulled in and diving Shackelford to score Samko. Casey Santos Ocampo fouled out to first for out number one but Cal Christofori caught up to a Begin fastball and drove it over the left center field fence for a two run homer to give Watertown a 3-0 lead. Begin ended the inning with two strike outs and allowed only one other hit in the game, a single in the sixth, but the Americans couldn't get anything done with the bats against Beck and the 3-0 lead held up. Begin (0-1), who helped St. John's Prep of Danvers to the Super 8 final this year, pitched a gem for the Americans in his first Intercity League start. He went six innings, allowed three earned runs on four hits. He struck out four Reds and walked one. Offensively, the Americans managed just five hits. Nick Herzog joined Hopkins, Shackelford and Huegi with singles and John Jennings added a two out double in the sixth. The Americans fell two games under .500 with the loss. Now 6-8, they've reached the halfway point of the season in sixth place, holding down the final playoff spot. They travel to Wakefield Sunday for a 4:00 contest against the Merchants at Walsh Field. Sean Smeglin will be on the mound seeking his second win of the season Sunday. The Lexington Blue Sox Drew Leenhouts pitched a one hit shutout to defeat the Americans by a score of 3-0 Monday night at Morelli Field. Leenhouts was one out away from a no-hitter when John Jennings doubled for the Americans' only hit. Chris Hopkins, who worked a pair of walks, was the only other American to reach base against Leenhouts who struck out seven Melrose hitters on the night. Zeke Berg made his first start on the mound for the Americans and pitched well enough to win, but the lack of offensive support did him in. He allowed three runs, all earned, on five hits while striking out five, walked five and he hit two batters. The walks and the hit batters hurt Berg as one of each scored. The other hit batter forced home a run. In the second, Lexington scored what proved to be the winning run. A leadoff walk to Dan Graham was followed by a single to left by Jake Willsey. Berg nearly escaped the jam by getting Taylor Ferguson to pop out to shortstop and striking out Josue Feliciano, but John Puttress worked the second walk of the inning to load the bases before Jeff Costello was hit by a pitch to force home the run. With one out in the fifth, Ross Curley was hit by a pitch. Berg then walked Julian Alvarez to put runners at first and second. Graham lined to right for out number two but Willsey singled to center to drive home the second Lexington run. In the sixth, the Blue Sox got one more. Feliciano and Puttress flied out to right ahead of a Costello walk. With pinch hitter Dorian Rojas at the plate, Costello stole second and third. He scored when Rojas singled up the middle for the third and final run. Ronnie Luke, who pitched one and a third innings of relief while allowing one hit and striking out three, took over for Berg after the Rojas single and struck out Ross Curley to end the inning. With the loss, the Americans fell to 6-7 on the season, leaving them in sixth place. Wednesday night at Morelli Field, Simon Gonzalez will make his first Intercity League start and the offense will try to get the bats going in a 7:30 rematch with the Blue Sox. Trailing 4-1 in the bottom of the sixth with two outs, the Americans exploded for five runs to overtake and defeat the Arlington Trojans by a score of 6-4 Sunday afternoon at Morelli Field. Will Shackelford, back after a two game absence, bunted for a single leading off the sixth. He moved to second on a Chris Hopkins ground out and to third when pinch hitter Hunter Boyce reached on an error by the Arlington second baseman. Shackelford scored the Americans first run of the inning and second of the game when Boyce was forced at second on a fielder's choice grounder to third off the bat of Matt Hosman for out number two. The Americans then put together five straight hits to score four more runs. Charlie Huegi moved Hosman to second with a single to right center. Dan Cacciola followed with a line single to right, moving Mike Goddu, who had gone in to run for Hosman, to third and Huegi to second. Nick Herzog, who had hit a solo home run in the first inning and singled in the third, then ripped a bases clearing double to left center, giving the Americans a 5-4 lead. Malcolm Nachmanoff drove in Herzog with the sixth and final run when he laced a solid single to center. John Jennings kept it going when he also singled but Shackelford lined out to center to end the inning. Shawn Smeglin pitched the first four and one third innings for the Americans giving up the four Arlington runs on five hits. He walked two and struck out two. He left with a run in and runners on first and second after issuing a pair of walks and a single. Aran Hamilton-Grenham (1-0), who got the win, was summoned from the bullpen to put out the fire, but he was touched for a single that drove in a run, hit a batter to load the bases and gave up a sacrifice fly that scored the third run of the inning and increased the Arlington lead to 4-1 before a strikeout ended the inning. Hamilton-Grenham pitched a perfect top of the sixth and the Americans' offense rallied for the win in the bottom of the frame. Chris Mitchell came on to pitch a scorless seventh to preserve the win and earn his first save of the season. The offense was led by Herzog's three hits, including the home run, and four RBI. Nachmanoff also had three hits and Jennings had a pair. Cacciola, Shackelford and Huegi had the other three Americans' hits. The Americans, who evened their record at 6-6 with the win over Arlington, will host the Lexington Blue Sox at Morelli Field Monday and again Wednesday at 7:30. On Friday, they will be on the road in Watertown to play the Reds at Victory Field. Game time in that one is 7:45. Southpaw Zeke Berg will get his first Intercity League start Monday night against Lexington. Melrose Matters: The Americans placed four players on the Intercity League All-Star team; outfielders Malcolm Nachmanoff (.394) and Nick Herzog (.343), catcher John Jennings (.308) and pitcher Chris Mitchell (3-2, 1 save). Mark Fusco, who underwent Tommy John surgery in 2015 and who pitched Wednesday for the first time this season, reinjured his arm and has been placed on the disabled list. The Americans lost their second game in two nights Thursday when the Wakefield Merchants shut them out 4-0 at Morelli Field. Wakefield got the only run they would need in the first inning off Melrose starter Kyle Autilio (0-3), who pitched five and a third innings, walking two and striking out two while giving up the four Wakefield runs on eight hits. He was followed by Ronnie Luke who pitched a perfect two thirds of an inning, striking out one. Zach Begin pitched a scoreless seventh while walking one Merchant. The Americans' bats remained dormant. After managing but five singles Wednesday against Somerville, they mustered only two hits off Wakefield starter and complete game winner Joe Maguire. Both of the hits, back to back singles by Matt Hosman and Dave Center, came in the fifth inning with one out. But Maguire induced a fly out to right off the bat of Charlie Huegi and struck out Mike Goddu to end the inning unscathed. He then pitched a perfect sixth and seventh to preserve the shutout. With the loss, the Americans (5-6) fell below .500 for the first time this season. They will attempt to even their record Sunday at Morelli when they host the Arlington Trojans at 4:00. Shawn Smeglin will be on the bump seeking his second win in that one. The Somerville Royals broke out the lumber in a thirteen hit attack Wednesday night at Morelli Field and handed the Americans a 9-3 loss. Trailing 2-0 after one inning, the Royals got one run in the second, three in the third, one in the fourth and four more in the sixth to complete the onslaught. Luke Ronchi and Wagner Gomez both homered for the Royals. The Americans managed only five hits on the night off Somerville starter and winner Soren Hanson. Thanks to Hanson's wildness, the Americans had numerous chances to score but they failed to take full advantage. In the first inning Dan Cacciola worked a leadoff walk. Nick Herzog and Malcolm Nachmanoff followed and both were hit by pitches to load the bases with nobody out. Cleanup hitter John Jennings doubled, driving home Cacciola and Herzog and pushing Nachmanoff to third. Chris Hopkins was called out on strikes and Dave Center walked to reload the bases but Hanson struck out both Charlie Huegi and Mike LaRovere to escape further damage. In the third, Jennings walked leading off and went to third on a single by Hopkins. Center followed with a sacrifice fly to right field that scored Jennings. Huegi walked to put runners at first and second but LaRovere flied out to center and Vin Scifo popped out to shortstop to end the inning. Hanson settled down after that, allowing only two base runners over the next two innings before giving way to Mike Massuli who pitched one hit ball over the final two. Chris Mitchell (3-2) took the loss for the Americans giving up eight runs, five earned, over four innings. Mike Peters pitched a perfect fifth, striking out the side in the process. He was replaced in the sixth by Simon Gonzalez who was tagged for four hits and three earned runs in one third of an inning. Gonzalez was relieved by Mark Fusco, who, due to arm problems, was pitching for the first time this season. Fusco finished the inning but not before Gomez touched him for a solo home run. Zach Begin pitched a scoreless seventh, striking out a pair of Royals. Cacciola, Nachmanoff, Jennings, Hopkins and Scifo had the five Americans' hits. The Wakefield Merchants will visit Morelli Thursday at 7:30. Kyle Autilio, seeking his first win of the season, will be on the mound for the Americans. Nick Herzog doubled to lead off the bottom of the first, went to third on a Malcom Nachmanoff single and scored on a sacrifice fly by Kyle Devin to give the Americans the only run they would need as they defeated the Arlington Trojans 1-0 Wednesday night at Morelli Field. Shawn Smeglin earned the win, throwing six innings of shutout ball against the Trojans, who lost by a score of 1-0 for the fourth straight game. Smeglin, who allowed only three singles through six innings while walking and striking out four, evened his record at 1-1. Mike Peters pitched the seventh inning and shut down the Trojans to earn his first save of the season. Herzog had two of the Americans five hits on the night, while Nachmanoff, Hunter Boyce and Mike Egitto each had one. With the win, the Americans improve their record to 5-4. They will play host to the Somerville Royal Wednesday night, July 5 at Morelli Field at 7:30. Chris Mitchell, seeking his fourth win, will be on the mound. The Americans hosted the Reading Bulldogs Monday and the visitors took home a 10-3 win. Chris Mitchell, who had given up only three runs in his first three starts, all wins, allowed four runs in five innings in this one to take his first loss. The teams were tied at 3-3 entering the top of the sixth when the Bulldogs exploded for seven runs on the strength of five singles, two walks, an error and a sacrifice fly. A lead off single spelled the end of Mitchell's night. He was relieved by Simon Gonzales who faced five batters and failed to record an out. He was touched for three hits, a walk and five of the runs. Gonzalez was also victimized by an infield error. Ronnie Luke was summoned from the pen to stop the bleeding and he did so by striking out a pair, but not before giving up a run of his own. Aran Hamilton-Grenham pitched a scoreless seventh while striking out two Bulldogs. Down 1-0 in the bottom of the first following a Ryan Wolfsberg solo home run, newly signed first baseman Kyle Devin gave the Americans a 2-1 lead with a long two-run homer to right. That lead was short lived however when Reading added a run in the second to tie it and a run in the fifth to take a 3-2 lead. The Americans again bounced back to tie the game in the bottom of the fifth. With one out, Dan Cacciola and Nick Herzog singled to put runners at first and second. Devin flied out to left for out number two but Malcom Nachmanoff delivered a ringing single to center that scored Cacciola with the tying run. That was the last run the Americans would score in the contest and the Bulldogs responded with the seven run sixth to put the game away. Cacciola, Herzog and Nachmanoff each had two of the Americans' nine hits, while Devin, John Jennings and Charlie Huegi each had one. With a record of 4-4, the Americans will again play host Wednesday when the Arlington Trojans visit Morelli Field. Game time is 7:30. Shawn Smeglin will be on the mound seeking his first win in that one for the Americans. The Americans traveled to Beverly Sunday night and were defeated 3-2 by the Reading Bulldogs. The Bulldogs rode the four hit pitching of Colby Morris and Max Mardany to secure the victory. Morris evened his record at 1-1, throwing six innings, allowing just two runs on three singles and one walk, while striking out six. Mardany pitched the seventh to earn his second save of the season. Reading jumped out to a two run lead in the third inning against Americans starter and loser Kyle Autilio. After allowing only four singles last week when the Americans were no-hit by the Chiefs Jared Freni, Autilio was again the victim of the Americans' lack of offense, giving up only six singles in this one. The Bulldogs loaded the bases with one out on three singles in the third. Autilio nearly wiggled out of the jam when he got the second out on an infield pop up, but left fielder Ryan Wolfsberg lined a sharp single to left to score a pair and put Reading up 2-0. The Americans tied the game in the top of the third with two hits and a Reading gift. Left fielder Mike Goddu worked a walk leading off. Shortstop Will Shackelford then singled Goddu to second before right fielder Malcolm Nachmanoff singled to center to score Goddu with the first run. When the catcher's subsequent throw to third sailed into left field, Shackleford scored to tie the game. Nachmanoff, who had taken second on the throw, was moved to third on designated hitter John Jenning's ground out to the right side, but Morris stranded Nachmanoff at third when he got catcher Hunter Boyce on strikes and third baseman Matt Hosman on a grounder to second. The Bulldogs pushed across the winning run off Autilio in the fifth when, with one out, right fielder Nick Berno, who had replaced injured starter Darren Hartwell in the top of the inning, singled. Berno then stole both second and third before scoring the winning run on center fielder Chris Bosco's sacrifice fly to right field. The Bulldogs threatened again in the sixth. With one out catcher Maycn Clifford singled driving Autilio from the game in favor of Zeke Berg. The lanky left hander from Lafayette College was immediately touched for a single by shortstop Kevin Marciano to put runners at first and second, but a ground out to second and a strikeout ended the inning. The Americans made some noise in the top of the seventh but failed to tie the game. With two outs, pinch hitter Nick Herzog blooped a single to right and second baseman Isaiah Berg walked putting runners at first and second. Mike Egitto was called on to pinch hit but Berg was forced out on Egitto's hard hit ground ball to second that ended the game. The Americans will host the Bulldogs Monday night at 7:30 at Morelli Field. Chris Mitchell, who has started the season with a 3-0 record, will toe the rubber for the Americans. Melrose musings: The Americans have allowed more than three runs in a game only once this season. That was against Watertown last Tuesday in a 7-6 Americans' win. In that game only three of the Watertown runs were earned, meaning the Americans' pitching staff has not allowed more than three earned runs in any game this season. Defensively, the Americans have made only six errors on the season. Three of those errors came during an opening game win over Lexington and two during the aforementioned Watertown game. The Americans have added left handed, power hitting Kyle Devin to the roster. Devin, who can catch and play any corner position, will be in the lineup Monday night. He played a couple of games for the Americans in 2015 before joining the Futures Baseball League. He returned to the Intercity League as a member of the Reading Bulldogs in 2016. Trailing 6-3 entering the bottom of the seventh, the Americans scored four runs to overtake the Watertown Reds and earn a hard fought 7-6 victory Monday night at Morelli Field. With the win, the Americans improve their record to 4-2, good for eight points and a tie for second place in the league standings. Watertown fell to 6-2 and remain in first place with twelve points. With the score tied 3-3 entering the seventh, Watertown scored three unearned runs off reliever Mike Peters on the strength of two singles an intentional walk and two uncharacteristic Melrose errors. Peters, who had pitched a perfect sixth inning, gave way to Ronnie Luke with two down. Luke got the final out of the inning to earn his first Intercity League win in his first league appearance. Shawn Smeglin started for the Americans, allowing three earned runs on four hits and three walks, along with two strikeouts in two innings. When Smeglin hit the leadoff man in the third, he was lifted in favor of Simon Gonzalez, who kept the Americans in the game with three shutout innings of work before Peters took over in the sixth. First baseman Charlie Huegi led off the bottom of the seventh with a sharp single to left off Watertown reliever Justin Forman. Isaiah Berg, pinch hitting for second baseman Vin Scifo, struck out before Matt Hosman pinch hit for center fielder Dan Cacciola and walked. Hosman was replaced on the bases by pinch runner Mike Goddu. Left fielder Nick Herzog singled to load the bases and the Americans were in business. Huegi scored to make it 6-4 when shortstop Will Shackelford was hit by a pitch. Right fielder Malcolm Nachmanoff worked the second walk of the inning to push home Goddu and make it a one run game. With third baseman Chris Hopkins at the plate, Forman uncorked a wild pitch allowing Herzog to score the tying run while Shackelford moved to third and Nachmanoff to second. Hopkins walked to reload the bases with only one out. Catcher Hunter Boyce then gave the Americans the walk off 7-6 win with a sacrifice fly to left that scored Shackelford. Nachmanoff led the offense with two hits, including a long double off the top of the center field fence, and three RBI. Herzog, Hopkins, Boyce, who doubled, and Huegi all hit safely for Melrose. The Americans, along with all Intercity League teams, will play in the "Geri DeAngelis Day of Baseball" at Lexington High School Field on Saturday. The Arlington Trojans will be their opponent in a 1:15 start. They travel to Beverly Sunday for a 7:00 game against the Reading Bulldogs at Endicott College. After being no-hit Wednesday night and with just twelve hits through their first four games, the Americans' bats came to life Sunday as they banged out fifteen hits to defeat the Somerville Royals 9-3 at Morelli Field and improve their record to 3-2. Third baseman Chris Hopkins, second baseman Charlie Huegi and catcher Anthony Licciardello had three hits each to lead the way. Left fielder Nick Herzog had a pair of hits, as did shortstop Will Shackelford and right fielder Malcolm Nachmanoff. Shackelford drove home four runs, while Hopkins and Nachmanoff, who hit his first home run of the season, each drove in two. Chris Mitchell pitched the first six innings to earn the win and run his record to 3-0. Mitchell surrendered his first runs of the season in this one, having shutout both the Lexington Blue Sox and Reading Bulldogs in his two previous starts. He gave up six hits, struck out six Royals and for the third straight game did not walk a single batter. Aran Hamilton-Grenham worked the seventh inning for the Americans, allowing a lead off single before getting a pop out to short and inducing a 6-4-3 double play to end it. Royals player/manager James McConville hit a two run, inside-the-park home run in the third off Mitchell when his fly ball to deep left center hit off the top of the fence and bounced back into play as the left and center fielders collided and went down. Before either could get up and retrieve the ball, McConville raced around the bases to score. First baseman Jake Cintolo also took Mitchell deep with a solo shot in the sixth. Starter Jonathan Richard took the loss for the Royals. The Americans are right back at it Monday night at 7:30 when they host the league leading Watertown Reds at Morelli Field. Shawn Smeglin will be on the mound for the Americans. Former Melrose American Chris Sharpe was selected by the Pittsburgh Pirates in the 14th round of the 2017 Major League draft Wednesday. Sharpe, who was the Intercity League Rookie of the Year in 2015 while playing third base for the Americans, was drafted as a center fielder out of the University of Lowell. He starred for the River Hawks in 2017, leading the team with an average of .338. He also homered 7 times while driving in 28 runs. The Americans dropped a pair of close games to the Andre Chiefs, 3-1 on Monday and 3-0 on Wednesday, to even their record at 2-2. Chiefs' pitcher Jared Freni (1-1) tossed his third Intercity League no-hitter Wednesday at Morelli Field to put a damper on the Americans' home opener. Freni was immense, striking out 14 on the night while walking three and hitting two batters. Americans starter Kyle Autilio (0-1) allowed only four singles but all came in the fourth inning when the Chiefs scored all of their runs. Monday night at Maplewood Park in Malden, the Chiefs scored twice in the second and once in the fourth off of Melrose starter Shawn Smeglin (0-1). Smeglin went four innings, allowing only three hits with four strikeouts and four walks. As always, the walks hurt. He was touched for two runs on two hits, two walks and a sacrifice fly in the second and a solo homer off the bat of Matt Nuzzo in the third. Zeke Berg pitched the fifth and sixth innings for the Americans. He didn't allow a hit, walked two and struck out four. Josh Desai (1-0) earned the win for the Chiefs with three innings of no-hit relief. The Americans scored their lone run with one out in the third off Chief starter Andrew Chin. Shortstop Will Shackelford and designated hitter John Jennings both worked walks before right fielder Malcolm Nachmanoff singled in Tufts' teammate Shackelford. The Americans, with a team batting average of .128 and thirty-nine strikeouts in ninety-four at-bats through four games, will try to get their so far dormant bats going Sunday when they host the Somerville Royals at Morelli Field at 4:00. Chris Mitchell, who has begun his Intercity League career with two consecutive, complete game shutouts, will pitch for the Americans. Sunday night at Endicott College, the Americans improved to 2-0 with a 2-0 victory over the Reading Bulldogs. Rained out twice since opening day, it was the Americans first game in 10 days and they took advantage of the layoff. A well rested Chris Mitchell, who beat Lexington opening night, took the ball again for the Americans and proceeded to throw his second consecutive, complete game shutout. He allowed six hits, with seven strikeouts and didn't walk a batter. In 14 innings covering two games, Mitchell has not allowed a run, has surrendered only 10 hits, has not issued a single walk and has struck out eleven. The Americans got both of their runs in the fourth. With one out left fielder Isaiah Berg walked and moved to second on a wild pitch. Center fielder Mike Goddu reached second on an error by shortstop with Berg holding at third. The Bulldogs paid for the miscue when third baseman Matt Hosman drove Berg home with a ground out to shortstop. On the play Goddu took third. From there he scored the second and final run when designated hitter Mike LaRovere lined a clutch two-out single to left. The LaRovere single was one of only three hits, all singles, that the Americans mustered in the game. Shortstop Will Shackelford and catcher John Jennings had the other two. Monday, the Americans will try to improve to 3-0 when they travel to Maplewood Park In Malden for an 8:15 game against the Andre Chiefs. Veteran right hander Shawn Smeglin, who fashioned a 2.97 ERA in 35.1 innings for the Americans in 2016, will be on the mound for the Americans. The Americans opened the 2017 season Friday night with a 3-0 win over the Lexington Blue Sox in Lexington. Chris Mitchell, pitching his first Intercity League game, tossed a 4 hit, complete game shutout for the Americans while striking out 4 and walking none. On the offensive side, the Americans had just 5 hits but they were timely. Catcher John Jennings tripled to right in the 4th to drive in shortstop Will Shackelford, who had walked, with the game's first run. First baseman Dave Center followed with a single to right to drive in Jennings. In the seventh, the Americans got their 3rd run when, with one out, center fielder Dan Cacciola dropped down a bunt single, stole second and scored on left fielder Nick Herzog's single to center. Right fielder Mike Goddu singled in the 4th for the Americans 5th hit. The Americans return to action Monday night at 7:30 when they host the Wakefield Merchants in their home opener at Morelli Field in Melrose. Shawn Smeglin will be on the mound for the Americans.